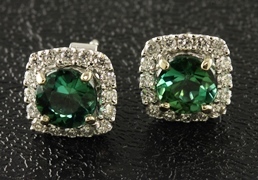 Set with brilliant green tourmalines and surrounded by beautiful white diamonds, these earrings are true gems! A lovely twist on turquoise...set in 14kt white gold and surrounded by a sprinkling of shimmering diamonds. 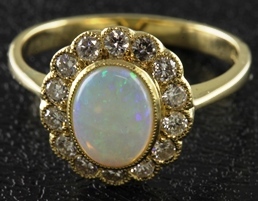 This lovely opal ring sits pretty on the finger. 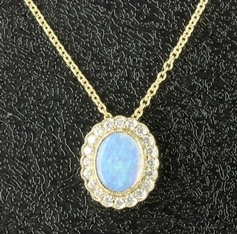 The diamonds are a perfect compliment to the fire of the opal. This is a well done, nicely proportioned ring. The sapphires and diamonds are bead set like in the old days. 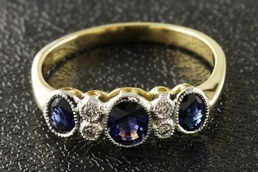 This ring sits flat on the finger and is very every day wearable, as well as, beautiful. Trade up your current diamond studs for a larger pair this holiday season! Bold and beautiful color! 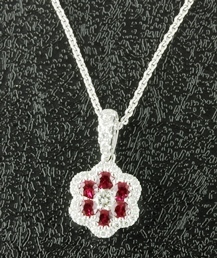 This ruby and diamond pendant is candy for the eye! 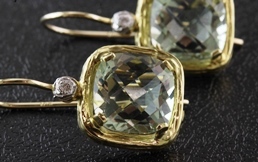 The green amethyst stones in these earrings have the subtle glow of spring in the air! The multi-faceted checkerboard cut makes them glimmer. Hand wrought, organic style gold is a nice compliment to the stones. A hand crafted ring with a lovely emerald at the center complimented by three diamonds on either side. 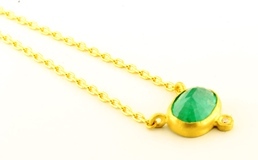 This beautiful necklace is hand made in Turkey with 24kt yellow and emerald gems that are hand faceted. 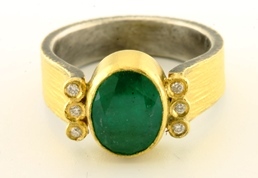 Handmade in Turkey in 24kt gold and a multi- faceted emerald. 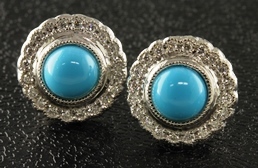 Made by hand in Turkey with glowing blue sapphires that attract the eye.